Windows 10 is here, and it’s ready for deployment to enterprises everywhere. If your organization is one of the many that avoided previous upgrades, be prepared for some changes in how Microsoft’s new operating system (OS) is deployed. A business upgrade to Windows 10 can be accomplished through remarkably automated means — if you know what to look for. 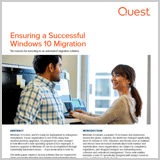 This white paper explores six key activities that are required for every successful migration and explains how automating those tasks will help you ensure a successful enterprise upgrade to Windows 10. – Are you prepared to make the shift to Windows 10 Pro? A fully updated and modern device is key to any successful cybersecurity strategy. But as of January 14th 2020, Microsoft will no longer offer security updates to any device running Windows 7. – Reduce migration complexity, and save valuable IT staff time. What if you could incorporate image deployments into your overall endpoint management strategy using one integrated solution?